The XD5300 solutions set a new storage standard for direct-attached storage. The series provides a smart and elastic runtime configuration of the 10 x 12Gb/s SAS wide ports support and allows IT managers to fully utilize the 480Gb/s data bandwidth per system for various applications. The XD5300 series is fully tested with various configurations and can deliver up to 24,000MB/s1 sequential read and 20,000MB/s1 sequential write in throughput and over end-to-end 4.2 million2 sequential IOPS. It is ideal for video editing, high performance computing, cloud storage, streaming, broadcasting, virtualization, and datacenters. QSAN XD5326 model (2.5” 2U 26-bay) is the industry’s first high density all flash/low power DAS storage. It has two more storage bays (around 8% more capacity) than the popular 2U 24-bay products available on the market. The XCubeDAS XD5300 DAS systems offer fully redundant components for all major functions, including dual controllers, power supplies, fan modules, host ports, and expansion ports. Besides hot swappable components, the XD5300 firmware is able to update firmware without any system down time and balancing IO loading through multiple paths and dual controllers. The XD5300 series features a fully modularized, cable-less architecture. In addition to Dual-Active controllers, all critical components inside the unit such as power supply modules, fan modules, and hot pluggable provide fault tolerance capabilities. 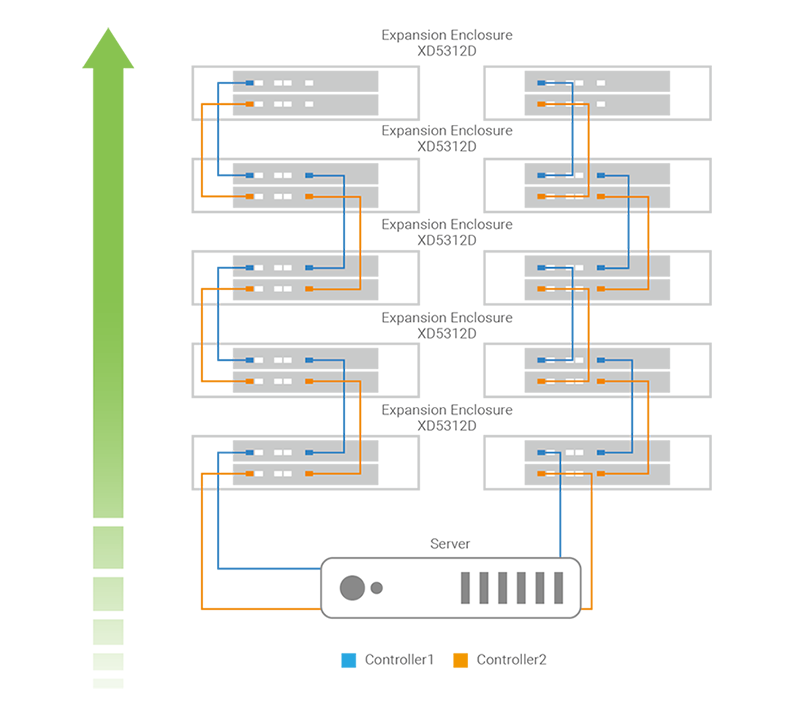 To provide a fault-tolerance and load-balancing storage system, all data paths in the system from hard drives, backplane, expander physical links, and front-end ports to servers have to be both hardware and well-defined firmware redundancy protection. The XCubeDAS XD5300 series is built with fully redundant paths and protection to every data I/O and compatible with Microsoft Windows MPIO, Clustering, and Linux Multipathing. The multipath software layers in the operating systems can leverage the redundant paths to provide performance enhancing, e.g., load-balancing, round-robin, failover, and dynamic reconfiguration. The XD5300 series expansion enclosures offer flexible drive configurations. For LFF chassis of XD5324/XD5316/XD5312 models, they support mix and match 3.5"/2.5" SAS, NL-SAS HDD, and 2.5” SAS, SATA3 SSD. For SFF chassis of XD5326 models, they support 2.5" SAS, NL-SAS HDD, and 2.5” SAS, SATA3SSD. For the maximum number of disk drives support, it depends on the capability of the HBAs and RAID controller cards4. 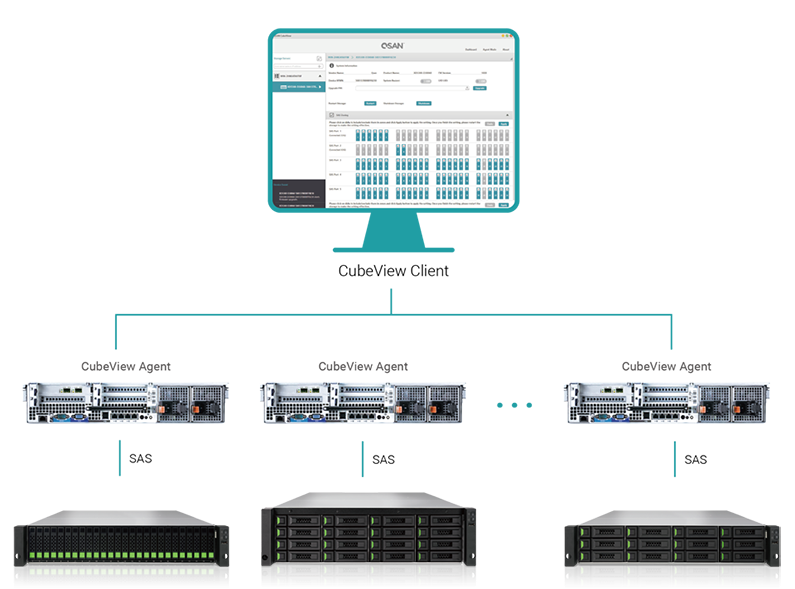 For the expansion of QSAN XCubeSAN series SAN storage, it supports up to ten of mixing XD5300 series for expansion and allows scaling up to 286 disk drives (including SAN storage). The XD5300 features all 12Gb/s SAS topologies and permutations of all host and expansion port configurations. The XD5300 series supports all 12Gb/s SAS topologies, including Cascade, Reverse, and Tree. The XD5300 series can be deployed freely to fit various connections to the host servers. 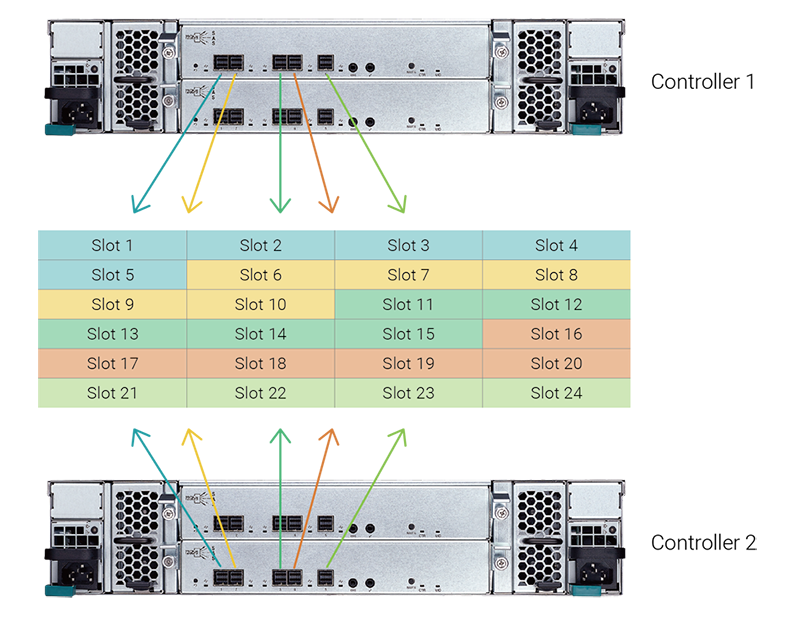 With up to 10 x 12Gb/s SAS ports support per system, this feature is crucial for users to plan a well-defined resource arrangement to achieve highly utilized performance and capacity of the XD5300 system. Users can select a specific group of disk slots and define a zone for it. There can be up to 5 zones per system. 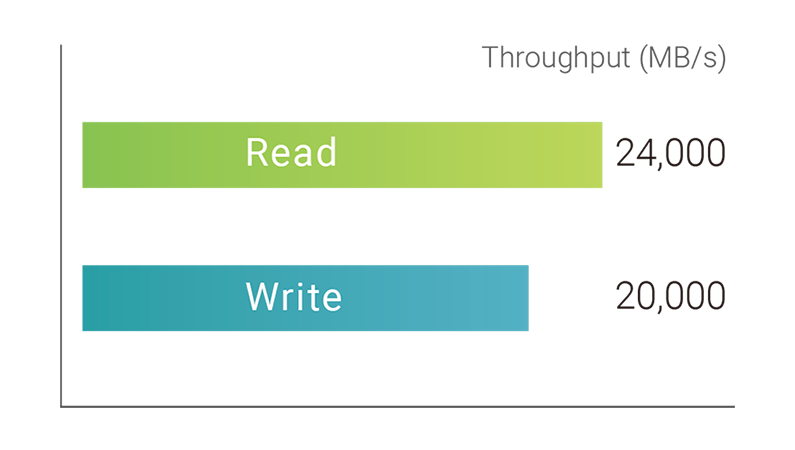 Each zone can be assigned to at least 1 x 12Gb/s SAS port. The zoning feature provides better security control even in the direct-attached system scenario. Users can use different zones for multiple host servers that connect to the same DAS systems and still have different access control for different zones. The XD5300 controller’s host and expansion ports can be configured and changed IN / OUT5 during runtime for different applications and environment requirements. The setting is effective immediately without rebooting the system. The 5 IN, 4 IN / 1 OUT, or 3 IN / 2 OUT configurations displayed below are recommended for better performance utilization. The XD5300 series has high interoperability. It supports host server running the following operating systems and virtualization environments. QSAN’s product development and test departments have invested extensive testing resources to verify compatibility with peripherals including HBAs, RAID controller cards, SAS HDDs, and SSDs to make sure there is maximum compatibility with the XD5300 series. The XD5300 series provides complete compatibility support of HBAs and RAID controller cards. In addition, QSAN has qualified the most popular SAS HDDs and SSDs on the market. Our users have the highest level of flexibility to choose from the most advanced HDDs or SSD flash drives and purchase the best cost/performance drives to suit their needs, significantly reducing IT infrastructure investment costs. The detailed compatibility matrix can be found on the QSAN website.